Picture of the colourful tulips which are in plentiful supply throughout the town of Niagara-on-the-Lake during spring in Ontario, Canada. of Wales Hotel, Niagara on the Lake, Ontario. One of my favourite spring time locations in Ontario is the small community of Niagara-on-the-Lake. Tulips of many different colours and varieties adorn the streets and parks and wave graciously in the breeze as though heralding the arrival of spring. 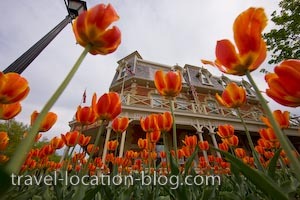 Colourful Tulips, Tulipa, outside the Prince of Wales Hotel (built in 1864) in the town of Niagara-on-the-Lake, Ontario, Canada.